There was always a risk that the RBA would feel pressured into a cut on Tuesday by intolerable strength in the currency it issues. So it was, it seems. Although sadly for the RBA, its decision to cut interest rates to take steam out of the AUD rally resulted in an AUD rally. While I have to say I was surprised at this misstep by the RBA (which among other things contributed to a continuation in the brutal bank sell-off, which I lazily supposed would be halted by a cut), it’s probably reaching a bit far to heap opprobrium on the RBA in this instance. There’s been a vicious bond sell-off lately and yield plays (i.e. our financials-stacked sharemarket), have naturally been getting smacked around. The market was also clearly looking for an excuse to buy AUDUSD. As I’ve detailed previously, most indicators have pointed to a mild improvement in Australia over the last couple of months, so much so that I found myself in the camp thinking a May cut might well have been off the table. In the end, the RBA met me half way, and markets moved on a tightening theme (or at least a no-more-easing theme, which is a sufficiently terrifying prospect for modern markets). All being dumped on contracting steel production. 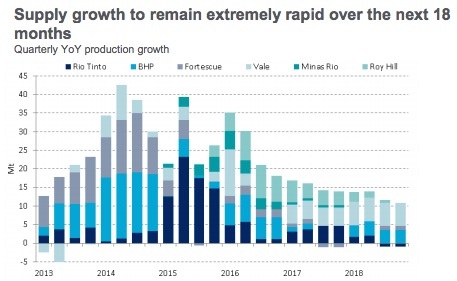 I can’t say how long the restock will persist, but the next time iron ore slumps it’s very likely to print fresh lows, pushing another few juniors towards the abyss, before eventually coming for FMG. The volume of iron ore futures traded on the Dalian bourse reached 18.6 million contracts in April, equivalent to 1.86 billion tonnes, according to data on the exchange’s website. That was a monthly record, and far surpassed annual global sea-borne trade of around 1.4 billion tonnes. An increase in volumes isn’t necessarily an issue, except that in this case market participants are obviously prone to leaping from one side of the boat to the other, and so we’re probably going to see more episodes of dizzying volatility this year. The RBA is not done cutting interest rates yet. This entry was posted in Uncategorized and tagged AUD, interest rates on May 7, 2015 by MJV.